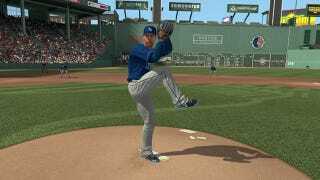 A contestant accused of cheating in last year's scandal-plagued MLB 2K Million Dollar Challenge pocketed $25,000 in this year's contest, staged under a new format—and with the exploits patched out. William Haff, of Owatonna, Minn., is not a finalist for a $250,000 grand prize in this year's contest, but he still did better than in 2012, when he won an all-expenses-paid trip to New York to compete for a winner-take-all million-dollar prize. (He was eliminated before the final round). Haff was accused by a fellow gamer last year of using an exploit to throw his qualifying game. This year, 2K Sports broke up the prize pool so that more contestants would win cash prizes. The goal of the contest, for the past two years, is not only to throw a perfect game, but to throw "the most perfect" game, in which the effort would be scored according to an algorithm that factored in the pitcher's rating, the quality of his opposition, and details like the number of pitches thrown and number of strikeouts recorded. A perfect game is any contest in which one pitcher retires every batter his team faces and wins, over a minimum of nine innings. This year, the top-scoring game thrown for each of Major League Baseball's 30 franchises would earn $25,000, and there was no restriction on multiple winners. Four gamers recorded multiple top-scoring perfect games—Steven Welcome of Orland Park, Ill. (with the Orioles and Tigers), Michael Mazro of San Jose (Astros and Mariners), Sean Jaquith of San Jose (Angels and Mets) and Robert Romanowski of Lanoka Harbor, NJ, with the Diamondbacks, Marlins and Padres. Jaquith and Romanowski also were finalists in last year's contest but did not win the grand prize. Five other finalists from 2012 also threw perfect games this year that did not qualify for either a franchise prize or a final round berth. Wade McGilberry, who took home $1 million in 2010 under the original first-guy-to-throw-one-gets-it-all format, threw three verified perfect games this year, but didn't score high enough to collect with any of them. Overall, 15 percent fewer attempts were made this year—"more than 785,000," 2K Sports said in a release, down from 942,895 last year—despite having four more days within the contest period. That could speak to MLB 2K13's status as a last-minute announcement, with a fraction of the marketing and publicity the series saw last year, and reviews (here and elsewhere) blasting the product as a reconditioned version of MLB 2K12. That said, more qualifying games were thrown—84 percent more than in the previous year, 2K said. So if the game didn't get any easier in patching out exploits—which allowed gamers to stock the opposing lineup with weak hitters—then it didn't get any harder either. The reappearances of so many previous qualifiers and winners seems to suggest this as well. Romanowski, the top qualifier, will meet with Oregonians Tyson Sanders and Justin Chavarria, and Brad Holland of Garland, Texas, in a four-way playoff during the week of the All-Star Game in New York. The winner gets $250,000.